The weather has been rough for farmers and livestock owners this past year, with blizzards, flooding and fires. With the skyrocketing price for hay, there's no end in sight to the stresses they are under. The price of hay has tripled for livestock owners in Missouri and throughout the Midwest; hay that was once $40 a bale is now being sold for $150. Wildfires in Kansas, rains in Iowa and drought in Missouri last year have all caused a shortage in the hay supply in the Midwest. 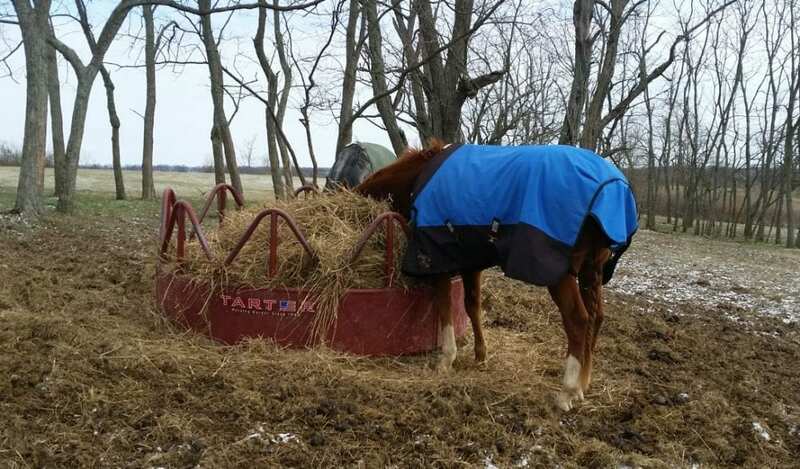 Horse owners in Missouri are having to travel as far as Oklahoma and Tennessee to try to find hay for their horses and other livestock. Other horse owners are giving their horses away as they can't afford to feed them. All livestock owners are hoping the grass grows rapidly so the animals can transition from eating hay to eating grass. The first cutting of hay is typically done in June, which will hopefully ease some of the shortage. Weather conditions are looking to be better for 2019, except for areas of flooding that could wipe out the hay crop grown near the Missouri River. Read more at Fox 4 News Kansas City. This entry was posted in Horse Care and tagged cutting, farmer, flooding, hay, price, shortage, skyrocket, stress, travel, wild fires by Paulick Report Staff. Bookmark the permalink.